Yuyan Garden - an "Urban Mountain Forest"
The Yuyuan Garden is found in the southeast part of the old city of Shanghai. Pan Yongrui, who was Sichuan Provincial Administrative Commissioner of the Ming Dynasty, built this private garden for his parents in 1559, or the 38th year of the Jiajing Reign of the Ming Dynasty. More than 400 years later today. it remains as the only ancient garden in urban Shanghai, and for this reason it is protected as a national cultural lcgacy. From day one the Yuyuan Garden has had its fill of ups and downs. It has changed hands repeatedly, and undergone major expansions on several occasions. The garden was also associated with many major historical events in Shanghai, but in terms of landscaping culture, it can well be regarded as a crystallization of the Chinese garden culture after the mid-Ming Dynasty. The Yuyuan Garden today is a veritable jungle of architectural structures, where the forms of artificially hills are reflected quiveringly in the ponds, and the entire place is hidden in the rich verdure of trees and plants. Small wonder ancients praised it as a "spectacle unseen anywhere in the southeast" and the "best garden in the southeast". A total of 48 scenic views - chambers, halls, pavilions, kiosks, corridors, walls, trees, rocks and ponds - are picturesquely laid out in this garden's 20,000-square-metre space. The artificial hills look real, and so do the caves. 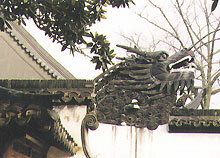 Five dragon-shaped walls divide the garden into six scenic zones with distinct features. The front gate opens onto an imposing hall, the Sanhui Hall. A horizontal board hung inside the hall is inscribed with a text stating that despite its location in a boisterous urban environ the garden is sequestered in a tranquil repose that can only be experienced in a mountain forest. Behind the Sanhui Hall stands a two-floor pavilion, with the upper floor known as the "Rain Folding Pavilion" and the ground floor named "Hall of Rising Mountain". Golden fish swim nonchalantly in the pond in front of the hall, which sits opposite a giant artificial hill across the pond. The hall provides an ideal view of the artificial hill, whose jumble of peaks and plunging ravines look so natural that one tends to forget they are nothing but man's creations. Professor Chen Congzhou, a famous expert of ancient architecture and garden culture, has this to say, "Of all the beauty spots in the Yuyuan Garden, the Giant Artificial Hill is definitely the best. In fact, among all the artificial hills built of yellow stone since the Ming Dynasty, this is the largest." Several thousand tons of stone was consumed in constructing this hill, whose main peak stands 12 metres tall. Zhang Nanyang, architect of this hill, was a celebrated hill builder of the Ming Dynasty. All the stones were quarried from Wukang county in Zhejiang Province. Both the textures of rocks, and their shapes, were taken into full account when this hill was being piled up to evoke memory of the real thing. The presence of a footpath, cliffs, ravines, and streams has contributed to the realness the builders purported to achieve. A kiosk stands atop the hill to commander the vista beyond the walls of the Yuyuan Garden. The Yuyuan Garden abounds in exotic scenes and sights. East of the Yangshan Hall is a corridor that promises to conduct the visitor gradually to the best vista. Behind the corridor is a long and narrow footpath in the shadow of a trellis that is entangled with a 300-year-old Chinese wisteria like a dragon. Beyond this path one scene unfolds after another, such as the Yule (Happy Fish) Waterside Chamber, the Wanhua (Ten Thousand Flower) Pavilion, the Shuihua (Water Flower) Wall, the Dragon Wall, the Dianchun Pavilion, and the Yuhua Hall, as well as the exotic Yulonglong Rock, the Jingguan Hall and the Ancient Theatre.